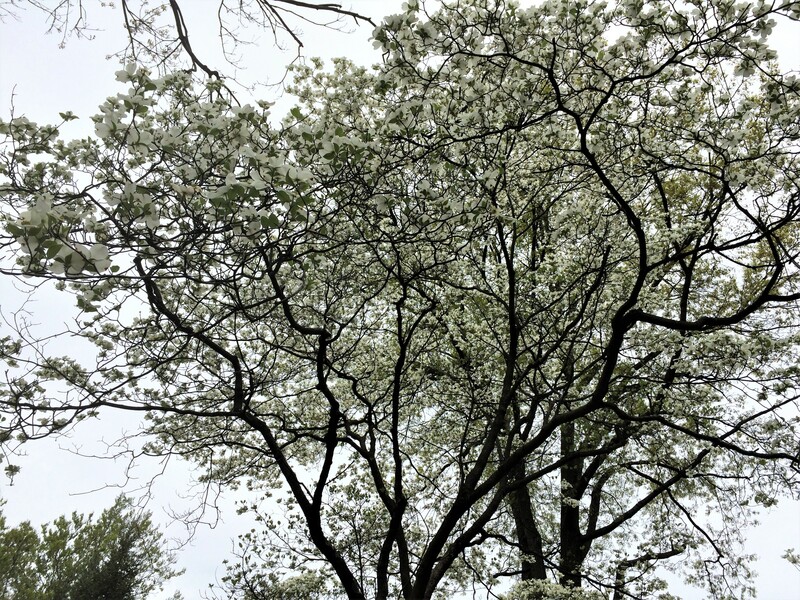 What were the odds that I’d be writing about spring for the second time in three weeks? Well, if you had asked me that question even one week ago I’d have said “slim, very slim.” But it turns out the odds were 100%, because here I am penning another paean to the greenest of seasons. To begin, there I was on the afternoon of April 24, denting, as usual, my favorite of the living room sofa’s three cushions. Such a comfortable spot it is. In fact, when I expire I’d like a memorial plaque to be placed on that cushion. It should read as follows: Neil Scheinin certainly made quite an impression. Here’s proof: He sat for so many hours on this sofa, the sensuous shape of his buttocks is forever recorded directly below. May Neil’s rear end, and his other parts, rest in peace. Once in a while, however, I do rise from my throne to meet and greet the outside world. And once in a while said excursions involve taking a pretty good look at what passes for nature in my home territory. To wit, the wondrously paved-over, built-upon lands of suburban Philadelphia. My first investigation of Spring 2017’s unfolding, which took place on April 11 (click here to read it), was less than a smash. Few maples and oaks and their brethren had sprouted much, if any, new greenery. 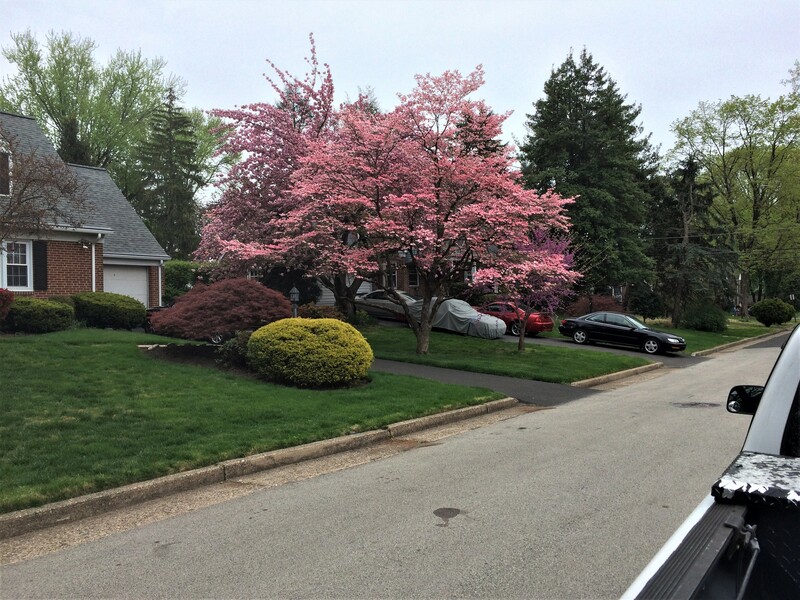 And blossoms on flowering trees and bushes were in short supply too. Two days later, though, driving around my region, I’d noticed that things were getting better, that spring was starting to look more like spring. It was a call to action. But I’m not a man of action. I waited a week and a half, until April 24 rolled around, before once again making my way into the wilderness. As with my previous springtime stroll I would be a seeker of colors other than green. Hell, I’m cool with green, but there’s just so damn much of it out there. Enough’s enough, don’t you think? What’s more, variety’s the spice of life. And I’d throw in another cliché if I could think of one. No, it was pale whites and pinks and soothing shades of violet and rocking reds and yellows that I was charged up to smile at. Hey, by now those hues would be popping out riotously, wouldn’t they? Hopping off the couch and into my car, I headed to a neighborhood I was slightly familiar with in a nearby township. I parked on a leafy street studded with good-looking houses and began my walk. It was 3:00 PM. Eureka! I struck pay dirt! I strolled along many blocks admiring the views. 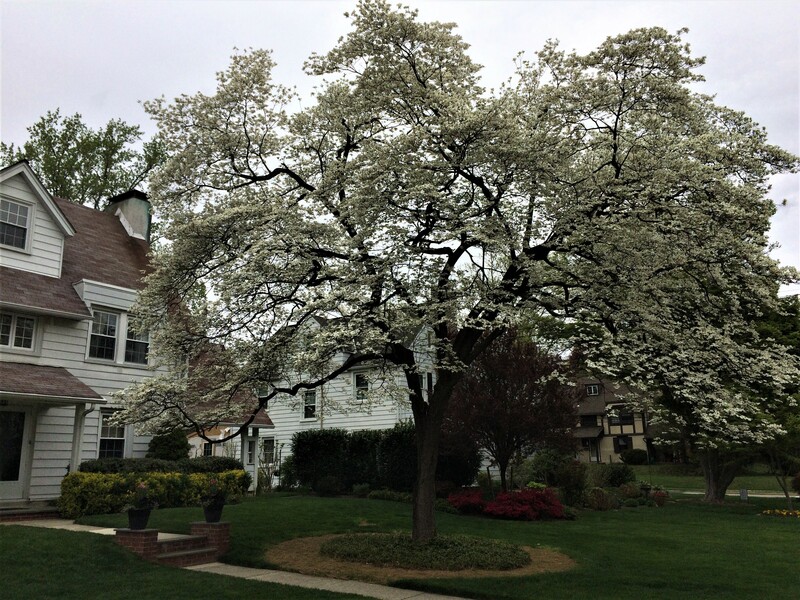 Dogwood trees and azalea and lilac bushes, all aflower, glowed serenely on nearly every property. 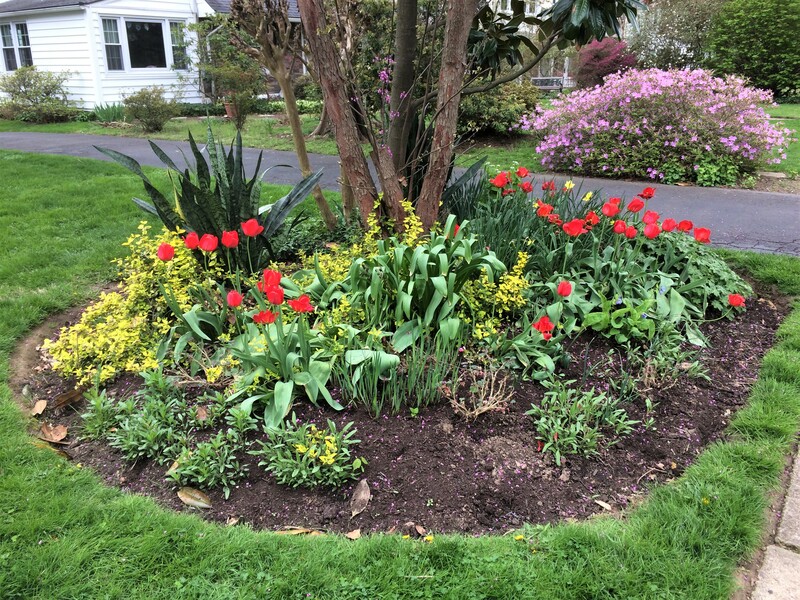 Beautiful flower beds — hey man, dig those snazzy, crazy tulips! — wowed like flashy jewels. I was in heaven. Or thereabouts. What’s more, the air was cool and comfortable, a light breeze tousling my Apollo-like tresses. And it was okay by me that the sky was overcast, as the clouds were not unhappy nor threatening. In other words I was amidst perfect walking conditions. No need to have slathered on sunscreen (I hadn’t). No chance I’d be shvitzing like a pig by the time my travels ended. Clearly, I was in a very good mood. Things were going my way. Although I was a mere mile and a half from my home, the sights were far better than those in my own township. These homeowners not only were with it, they were into it, putting a whole lot of time, effort and bucks into creating fine outdoor canvases. Now I know where to head to decompress, other than the emergency room, when my blood pressure starts pushing 230/130. My journey was a quiet one, decibel-wise, except for the manic dog barking its head off in a yard. Of course, that’s one too many, especially if you’re an unfortunate soul living within 150 feet of that animal and its owner(s). Other than that, everything was peaceful. None of the cars passing by hit their horns. And the only other sounds of note that I met, besides the voices of the people walking on the streets, were those of something I hadn’t encountered in a pretty long time — the whirs of a bicycle bearing down on me from behind. Deftly I stepped off the sidewalk, moving onto a front lawn, and watched a nine-or-so-year-old whiz by on his two-wheeler. “Thank you!” he yelled to me. Holy crap, I really must have been in heaven, that place of the heart and mind where I’m certain it’s a prerequisite for children to have the finest of manners. “You’re welcome!” I shouted in return. At 4:00 PM I returned to my car. I hadn’t felt so chipper in weeks. I’ve got to get out more in the suburban version of the great outdoors. Hi Joyce. 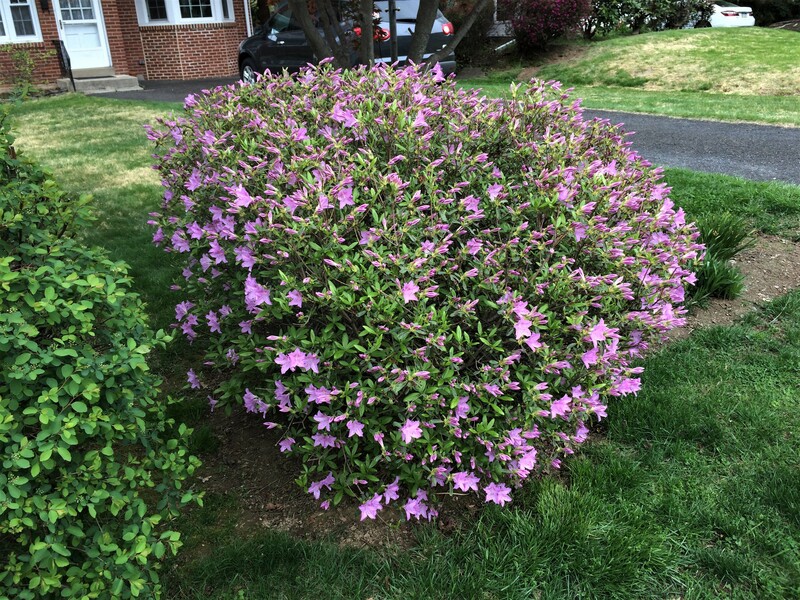 Your azaleas are beautiful. 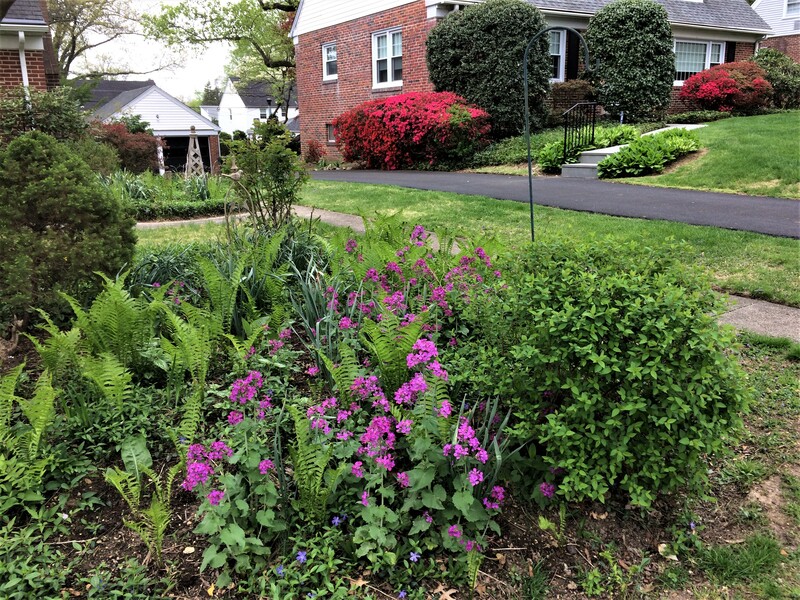 But, I decided to write about the sights in a different neighborhood for this article. Nice pics – It’s all getting very pink over here with us too, Definitely good for the spirits. Hi, Alyson. It’s a nice time of year, definitely. We’ve had a miserable spring, here on the Pacific Coast. I continually gripe about it. The blogosphere is full of my complaints. But today, a ray of hope—there’s sunshine, and higher temperatures tomorrow, the weatherperson promises! Thought it would never come! Thanks a lot for stopping by. I’m glad to have an update from the opposite side of the continent. I can’t comment. No music or flicks. (I’m going to pass this one off to the woman I’ve been hanging with for a few years. This is right up her alley. Thanks Neil, It will score me some points) CB likes the pretty pictures. CB, I’m glad if I score a few points for you — I’m here to help! She read it and liked it. Starting with the plaque you had her. She’s the horticulturist at our place so she loved all the pics. I’m in the good books for a while. Thanks. Good to see you can even find lovely excursions in suburbia. Hope that kid on bike keeps his manners! Hi. Thanks for visiting. To be honest, that boy on the bike has better manners than me. I’m on the grumbly side! I loved meandering with you on this walk. It sounds like a perfect spring day to me, and they are to be treasured. I also liked your description of colors: “No, it was pale whites and pinks and soothing shades of violet and rocking reds and yellows that I was charged up to smile at.” I understand that feeling as well. It’s good to stretch the legs on a nice spring day. Take care, Janet. Till next time . 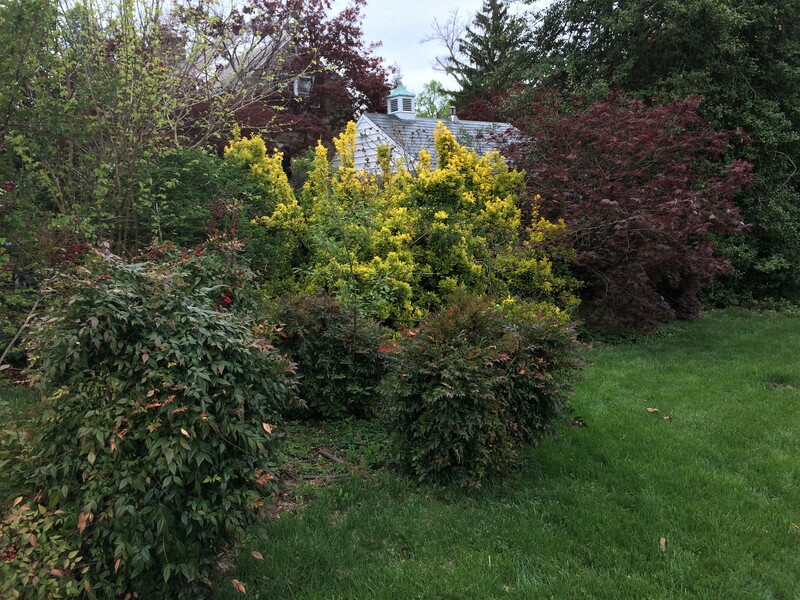 . .
Neil, this had me right there in the Philadelphia ‘burbs with you, and, like your last post on the topic, surprised me as to how many key Spring plants are common to your part of the world and the Scottish Lowlands. Plus I learnt a new word – schvitzing: http://www.urbandictionary.com/define.php?term=shvitzing – keep it up, buddy! Andrew, I’m glad to have expanded your vocabulary. It’s a funny word. 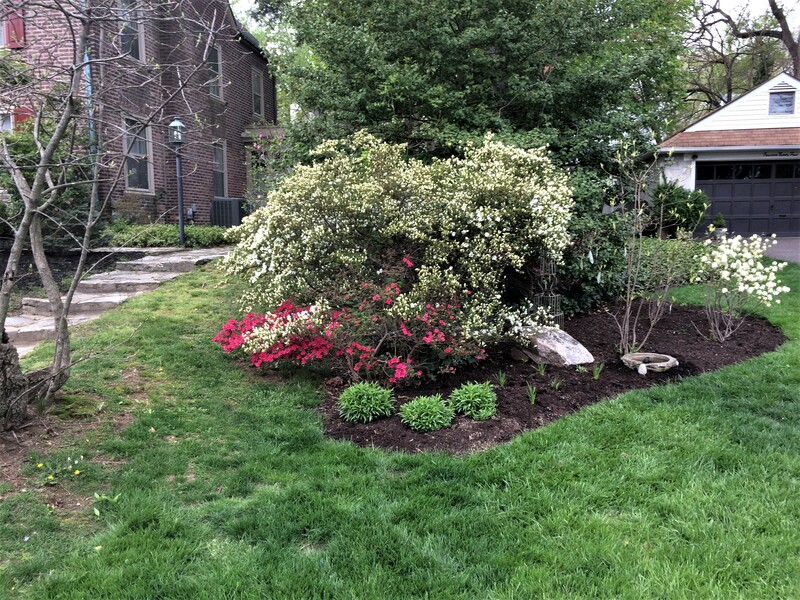 My yard looks great now, too! Spring rocks! Hello PJ. And grass grows. I’m heading outside in a few minutes to mow my lawn. Haha! If you got a goat 🐐 you could put your feet up instead! 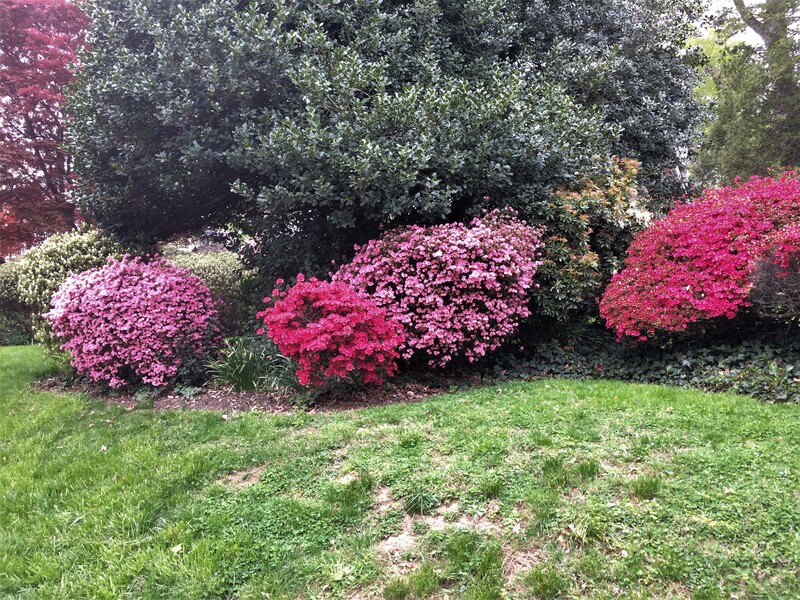 Glad to see the local landscape found its color gene! Hi. Spring has been great so far in my region. Cool temperatures, which is the way I like ’em. Hi, Charlotte. Thanks for visiting. Yesterday was a very drab and rainy day where I live in the USA. But today the sun is shining and everything is colorful once again. Hello Cathleen. I agree. I’m looking forward to 2018’s spring. We down south in Australia are on the cusp of winter. Here in the Highlands the trees are almost bare but the daffodils are already bursting up through the soil. Great post this one. I love the tulips! 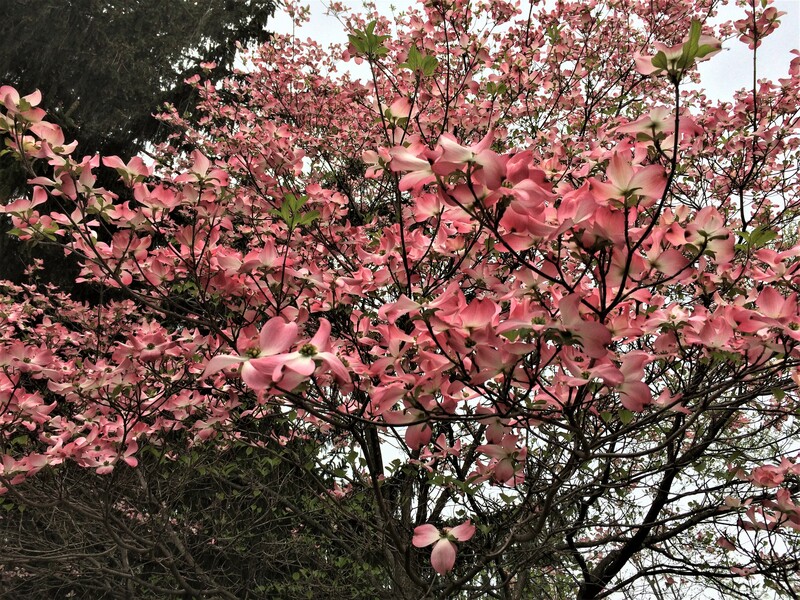 Here in the USA many of the flowering trees and bushes are still full of flowers. But I suppose that won’t be the case a couple of weeks from now. Thanks for stopping by. I’ll be seeing you.